I feel like I've been seeing orzo recipes everywhere lately. On the blogs, there was this one and this one, and my cousin served an orzo dish when I was at her place last week. So I decided to join the club and cook an orzo recipe for dinner last night. 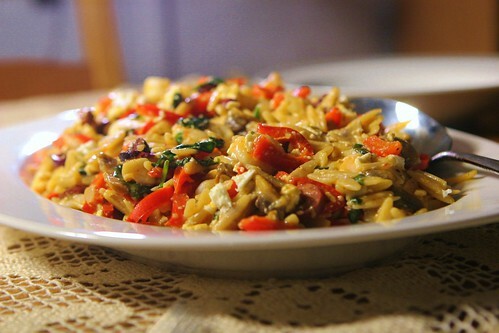 Mediterranean flavors work so well with orzo, so I went in that direction - why mess with something good, right? When I cook pasta, I usually bulk it up with lots of vegetables, and this time I used red peppers and mushrooms. With shrimp, olives, basil, feta cheese, and a generous amount of lemon juice, this recipe is healthy and packed with flavor. I'm so glad we had a lot of leftovers - I can't wait to eat this for lunch tomorrow! Bring a pot of well-salted water to a boil. Add orzo and cook until tender. Drain orzo, reserving ½ cup cooking water. Melt 1 tbs butter in a large skillet over medium-high heat. Add shrimp and saute until just cooked through. Transfer shrimp to a bowl. Add remaining 1 tbs butter to the skillet. Add mushrooms and saute for 3-4 min, or until mushrooms have softened and begun to release water. Add pepper slices and cook for 15 min, or until peppers are tender and reduced in size, and excess water has evaporated. Add garlic and cook for 30 seconds, or until fragrant. 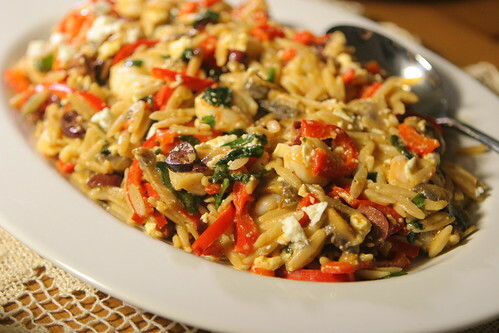 Toss orzo with vegetables, shrimp, olives, feta, and basil. Stir in reserved pasta cooking water, lemon juice, and extra-virgin olive oil. Season to taste with salt and freshly ground black pepper. Serve warm or at room temperature. There is something extra delicious about pasta when it's a fun shape like orzo (or bow ties, in my opinion). I love the feta, olives and shrimp in this! I love eating these kinds of dishes at room temperature (or cold even) for meals when the weather gets warm. These flavors sound amazing together. orzo are one of my favorite noodles to eat- I'm loving everything about this dish! Orzo is one of my favorite pasta shapes! It definitely makes for the best pasta salads, that's for sure. The mediterranean flavors in this are spot-on awesome! Looks delicious - I would love a bowl of this to take for lunch! So funny, I just had orzo last night! I love orzo with mushrooms... sort of like a yummy mushroom risotto the flavors compliment each other so well! !